Like the Everest-climbing George Leigh Mallory, modder Tyler saw a Linksys router and decided to shove a MacBook inside, "because it's there." Well, it was either that, or a Billy the Big Mouth Bass. 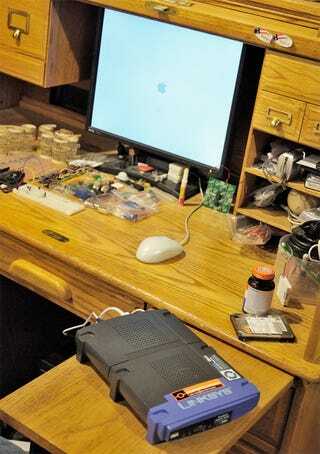 Using two Linksys routers, he rammed the MacBook's parts, along with the iSight camera and microphone in the joined-up cases, loaded Leopard and after slaving over it in the workshop for a few weeks, he was able to connect it to his monitor successfully.